This table top machine has been rated ideal for microdosing sterile dry powders and external dry syrup filling. The design is unique and extremely functional. The equipment is simple to operate, easily moveable and occupies minimal space. This machine gives optimum production with minimum weight variation. This machine is suitable for filling 100 mg. to 75 gms. with interchangeable parts. On request this machine can be Manufacturerd to fill 75gms. to 150 gms. 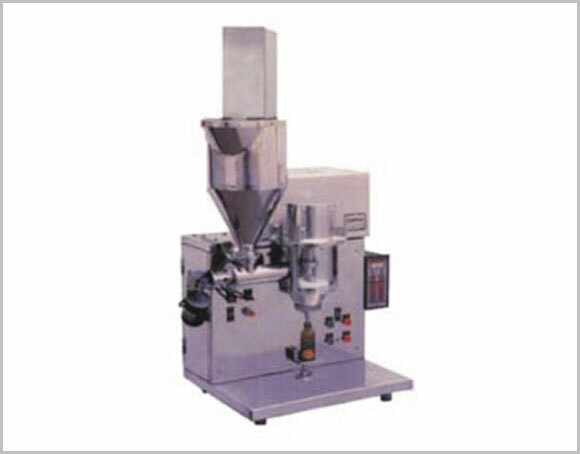 Versatile, can handle microdosing and dry syrup powder filling Pre-set revolution control with digital display for quick setting of fill weight Instant brake mechanism for precise fill weight Powder level maintaining system for maintaining constant level of powder to facilitate minimum weight variation Weight variation ±2% max normally within 1% Quick interchangeability in minutes for changeover of products. 0.5 H.P. Motor (Supplied with 440 V 3 phase or 220 V Single phase or as per customer’s requirement). Electro magnetic clutch/brake combination unit with 24 V. D.C. Supply. 30 – 35 FILLS /MIN. for Microdosing dry powder injectables. 25 – 30 FILLS / MIN. for Dry Syrups and other powders. 35″(W) x 25″(D) x 47″(H). Weight : 1 60 Kgs. approx. Gross weight : 230 Kgs. approx.